Anybody who is a fan of Superbikes, will of course be familiar with the Yamaha YZF R1. 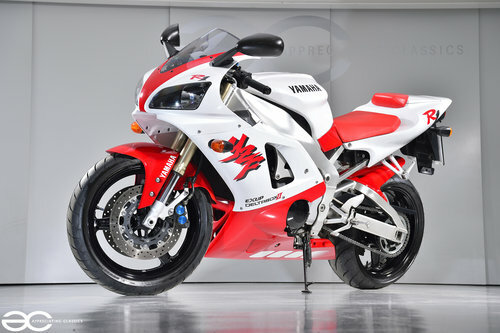 Having long been playing catch up to the Honda Fireblade which was released in 1992, Yamaha set about a totally new design from the ground, and in 1998 the Yamaha R1 changed the face of Superbikes upon release, creating quite the frenzy at the time. 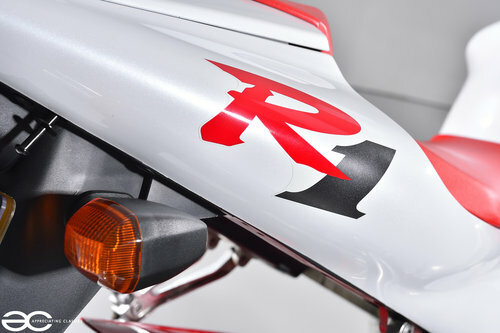 Thanks to the revolutionary ‘stacked gearbox’ design, the R1 was a much more compact design than previous models and this meant that the R1 was not only a bike with a hugely impressive power to weight ratio, but the design helped with the ability to create a chassis which could handle the power properly with superb handling characteristics. 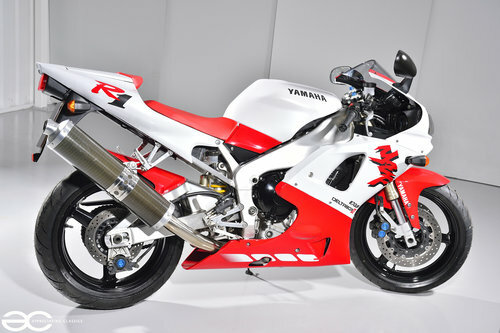 Speaking of power – the R1 came a claimed 150bhp and 177kg (dry) weight, this meant for some utterly devastating performance figures, with one magazine timing a 0-60mph time of 2.9 seconds, and a 0-100mph time of 5.9 seconds. 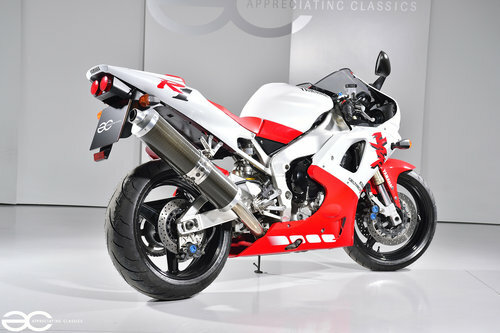 Here is a chance to own a piece of 90’s superbike history, in the sought after pearl white and red colour combination. Optional seat cowl (rear seat also included). Spare key with coded tag. Original order form, invoice & payment receipt. 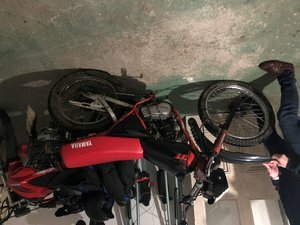 No modifications, the bike is still sporting the original exhaust, indicators, number plate holder and even the original rear reflector. Originally supplied by Carnell of Birmingham on the 18th of April 1998. Complimenting this stunning example is a lovely history file, which includes the original order form, invoice & payment receipt. 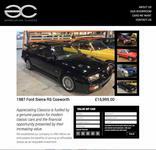 Plus the original booklets, deliver receipt, spare key, MOT history and Service history, recall paperwork and various invoices. 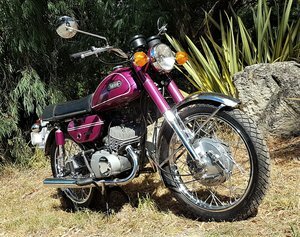 The original owner kept this bike for 14 years, before selling on to the second owner in 2012. MOT and service history help warrant the mileage of this stunning example, showing regular but little usage to help keep things in great working condition over the years. 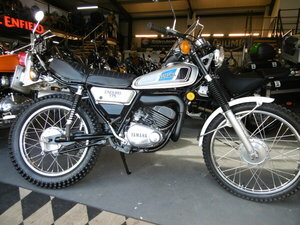 As you would expect of a bike with such little mileage, it is in superb condition throughout. All paintwork and decals appear to be original, and the pearl white with the red makes for a very striking bike indeed, sure to attract compliments wherever you may choose to ride it. No damage to any of the panels, other than a very small bit of patina to the bottom of the bellypan behind the front wheel, which is of course to be expected. The seat cowl is an optional extra, with the rear seat being included with the bike also. 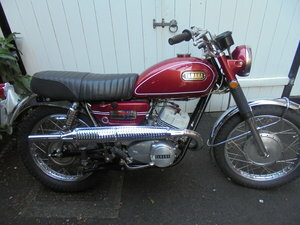 Original screen is still fitted, along with original mirrors and indicators, the number plate holder is original with no modifications (‘cutting down’ of the number plate holders was very common) and remarkably the bike even still has the original rear reflector fitted – these were often removed and thrown away. Overall a truly beautiful example throughout. All trim is is very good condition. 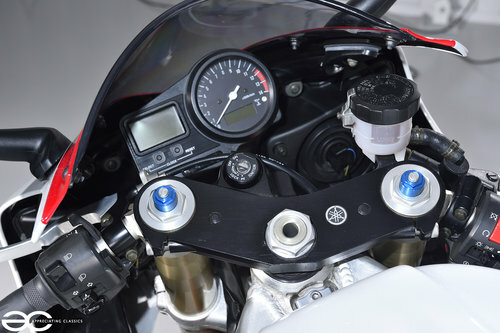 Obviously things such as the handlebar grips are almost as new, bar ends are unmarked, and the top yoke is free from any scratches (often caused by keys in the ignition flapping around on to the top yoke). Both the seats are in great condition, still being a vibrant red, and even the rubber on the underside of the gear lever is still in place, and unworn. The engine runs beautifully, even from cold on choke. No rattles at all, lovely quiet top end of the engine (these bikes can be a little noisy at the top end of the engine). All gears engage nicely, and the clutch operates perfectly well. The bike rides smoothly through the rev range and gives impressive performance. 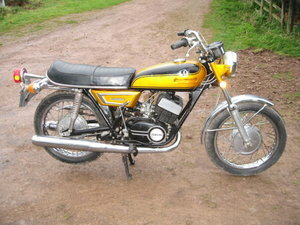 The original exhaust is still fitted, so the bike gives a nice noise but nothing too loud. As with the rest of the bike, the running gear is all original and in great order. Suspension and brakes feel fantastic, with superb braking performance and handling. A recent set of new premium Dunlop Sportmax Qualifier tyres have been fitted.